A Czech-built 304 CZ at Flugsportgruppe Grimming in Austria. The Glasflügel 304 is a composite 15 metre Class single-seat sailplane manufactured by Glasflügel between 1980 and 1982, and recently put back in production by the Czech company HpH Ltd. 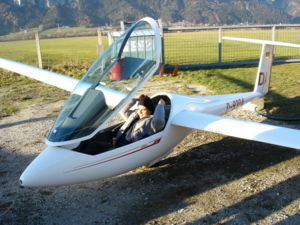 The 304 was the second and last glider developed by Glasflügel in cooperation with Schempp-Hirth. It superseded the Glasflügel Mosquito. The principal designer of the 304 was Martin Hansen, known for his role in the design of the Akaflieg Braunschweig SB-11. The glider continued the Glasflügel tradition of innovation: the parallelogram control stick, combined trailing edge flaps and airbrakes, automatic trimming, heel-operated brakes, automatic control connections, the extremely easy assembly of the wings and tailplane, the parallelogram forward opening canopy and lifting instrument panel are Glasflügel innovations largely copied by other manufacturers. The prototype flew for the first time in May 1980 and entered production shortly after. Glasflügel was struggling by then, following the untimely death of Eugen Hänle, the founder of the company, in 1975. A partnership with Schempp-Hirth led to a surrender of technology. Lacking investment and an energetic leadership, the company folded in 1982. The 304 was slightly less performing than the contemporaneous ASW 20 and did not succeed in top level competition. It enjoys however an excellent reputation for its flying qualities and craftsmanship. The 304 was recently put back in production by the Czech company HPH Ltd, as the Glasflügel 304CZ. This new production run uses the original Glasflügel moulds and jigs that fortunately were not lost with the demise of the company. The 304CZ was updated with the addition of winglets and a few other changes, and has spawned several derivatives, namely a 17.43 m span variant, the Standard Class 304C Wasp and the recently completed 304S. The 304 is sometimes referred to as the H-304, which is not correct, as the H applies only to the Glasflügel sailplanes designed principally by Wolfgang Hütter. This page was last edited on 6 March 2007, at 08:47.